These days, we take it for granted that our sports are played on manicured turf. We argue about how well- tended a ground may be, but we don’t have any reason to doubt that the machinery exists to keep the grass short, even and vigorous. It’s fair to say that most of the games we play today could not be played in a recognisable form in a world without lawn mowers. The first lawns were seminatural, and were the result of intensive grazing on small pockets of enclosed pasture on large estates in the moist maritime regions of north- west Europe. The really wealthy could afford to keep lawns through scything and hand shearing, but even here they often relied on grazing animals for assistance. By the 17th century, a manicured lawn was a way of showing the world that were you rich enough not only to use land for purely decorative purposes, but to pay the army of gardeners needed to groom it. Thus the closely- cut “English” lawn was born – but the whole point of it was its rarity and expense, and the gardens it adorned were geometric and patterned to emphasise the ascendancy of Man – or at least of their owners – over the natural world. The 18th century saw the golden age of English landscaping. It was the age of Lancelot “Capability” Brown, when the aristocracy strove to outdo one another in the splendour of their grounds. Brown convinced the aristocracy of the beauty of the “romantic” style of landscaping, in which artifice was used to celebrate the natural world instead of ostentatiously regulating it. Brown created flowing, gracious sight-lines using carefully sited trees and copses, and serpentine bodies of water by artfully damming small streams. Brown’s work lives on in such estates as Blenheim Palace, and the pastoral ideal he strove so successfully to create included keeping small herds of sheep and deer on the “pasture” visible from the great house. This must have greatly eased the task of keeping the grass cropped, because the alternative was still the scythe or the hand shear. A lawn was still a symbol of wealth. That changed in 1830, at the hands of a man from the English Midlands called Edwin Budding. Budding was an engineer who had seen in a local cloth mill a machine that used a revolving cutting cylinder to trim the uneven nap of woollen cloth. He built a mowing machine with a 19 inch cutting cylinder driven by a rear-mounted land roller, throwing the clippings forward into a forward- mounted bin. It was crude, but it worked, and it embodied all the crucial elements of the push mower. 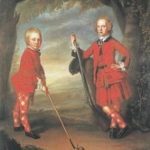 Crude and inefficient though we would now find them, these early mowers transformed the care of turf, democratised the English lawn, and gave us sports like football, tennis in the form in which we know them today. But when we look at depictions of bowls before the 19th century it’s soon clear that it resembles our modern game in name only, played on whatever patch of ground was available for the purpose. The big change came with the invention of the lawn mower. For the first time, large numbers of greens could be prepared to a standard specification. A bowler could play the same game in Gloucester as a bowler in Glasgow. The possibilities for organised competition exploded, and the need for a unifying code of rules arose for the first time. In 1849 a Scottish bowler called William Mitchell wrote the first “Manual” of bowls intended to regulate the game not just for his own club but for all bowls play. The lawn mower performed a similar service for the sports of golf, football and tennis, and changed the way the public thought about sport. Villages, towns and eventually countries could engage in meaningful competition. At the same time, the mower democratised the lawn. The lawn mower continued to improve, with horse- drawn models and, at the turn of the 20th century, a short-lived flirtation with steam power. In 1919 a golf club in Minneapolis asked a local engine- maker called Toro to devise an alternative to its horse- drawn fairway mowers. The machine they produced was based on the chassis of one of the tractors for which they had been making engines. The machine was a success, and Toro embarked on a development program that saw the manufacture of a 30” walk-behind power mower in 1924. Toro marked its commitment to turf care with the appointment of a Scottish golf course groundsman, Mungo McLaren, as its golf service manager. Firmly established as a leader in golf green mowing, the company turned its gaze to other aspects of turf care, including rolling and irrigation. Toro’s leadership of turf care survives to this day, and at Tquip we’re proud to distribute their products.